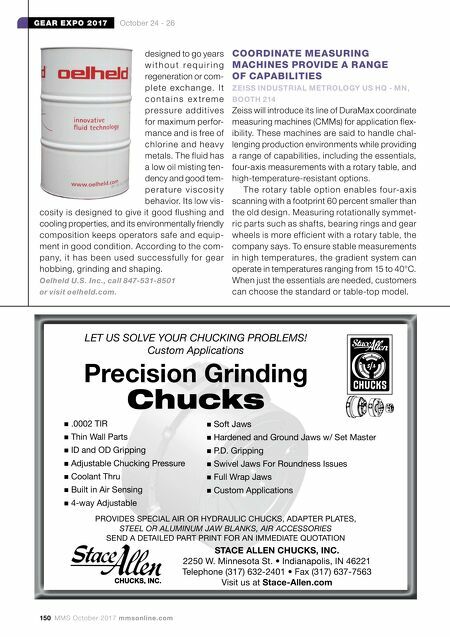 150 MMS October 2017 mmsonline.com GEAR EXPO 2017 October 24 - 26 .0002 TIR Thin Wall Parts ID and OD Gripping Adjustable Chucking Pressure Coolant Thru Built in Air Sensing 4-way Adjustable LET US SOLVE YOUR CHUCKING PROBLEMS! Custom Applications Precision Grinding Chucks PROVIDES SPECIAL AIR OR HYDRAULIC CHUCKS, ADAPTER PLATES, STEEL OR ALUMINUM JAW BLANKS, AIR ACCESSORIES SEND A DETAILED PART PRINT FOR AN IMMEDIATE QUOTATION STACE ALLEN CHUCKS, INC. 2250 W. Minnesota St. • Indianapolis, IN 46221 Telephone (317) 632-2401 • Fax (317) 637-7563 Visit us at Stace-Allen.com Soft Jaws Hardened and Ground Jaws w/ Set Master P.D. Gripping Swivel Jaws For Roundness Issues Full Wrap Jaws Custom Applications designed to go years w i t h o u t r e q u i r i n g regeneration or com- p l e te e xc h a n g e. I t c o n t a i n s e x t r e m e p re s s u re ad d i ti ve s for maximum perfor- mance and is free of chlorine and heav y metals. The fluid has a low oil misting ten- dency and good tem- p e r a t u r e v i s c o s i t y behavior. Its low vis- cosity is designed to give it good flushing and cooling properties, and its environmentally friendly composition keeps operators safe and equip- ment in good condition. According to the com- pany, it has been used successfully for gear hobbing, grinding and shaping. Oelheld U.S. Inc., call 847-531-8501 or visit oelheld.com. COORDINATE MEASURING MACHINES PROVIDE A RANGE OF CAPABILITIES ZEISS INDUSTRIAL METROLOGY US HQ - MN, BOOTH 214 Zeiss will introduce its line of DuraMax coordinate measuring machines (CMMs) for application flex- ibility. 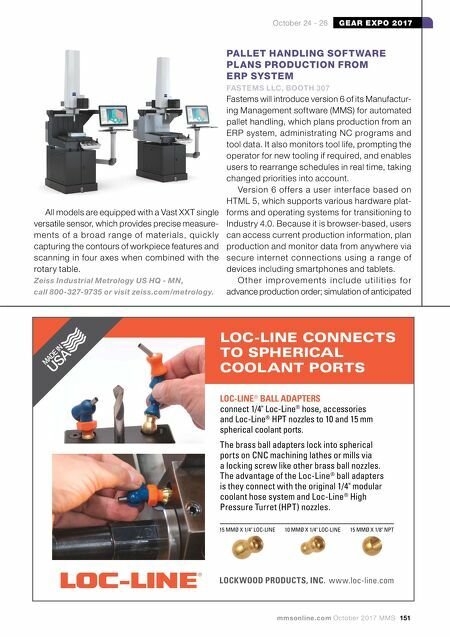 These machines are said to handle chal- lenging production environments while providing a range of capabilities, including the essentials, four-axis measurements with a rotary table, and high-temperature-resistant options. T he rotar y table option e nable s four-a x is scanning with a footprint 60 percent smaller than the old design. Measuring rotationally symmet- ric parts such as shafts, bearing rings and gear wheels is more efficient with a rotary table, the company says. To ensure stable measurements in high temperatures, the gradient system can operate in temperatures ranging from 15 to 40°C. When just the essentials are needed, customers can choose the standard or table-top model.